An Academic Hospital sets itself apart through the exemplary care it offers to patients, through the practical training it provides to the next generation of healthcare professionals and through the research it undertakes to advance the boundaries of knowledge in health and medicine. Montfort is designed With You and For You, offering exemplary person-centred care. Every person who walks through the door – to receive care, to visit a loved one, or to do their job – can expect to enter an exceptional environment that offers the highest standard of care and services, underpinned by an unfailing commitment to continuous improvement. At Montfort, each patient is the most important. Pathological effects, whether they be physical or mental, are susceptible to multiplying. Too many patients suffer from multiple illnesses at the same time. Anyone who has experienced this, or seen it amongst close ones, can testify the impact it has on your life: appointments at different specialists, different referrals. The Centre for Clinical Excellence in multimorbidity, a flagship project for Montfort and l’Institut du Savoir Montfort – A Knowledge Institute, will improve the lives of our patients by arranging for them to meet with all their specialists in a single visit. 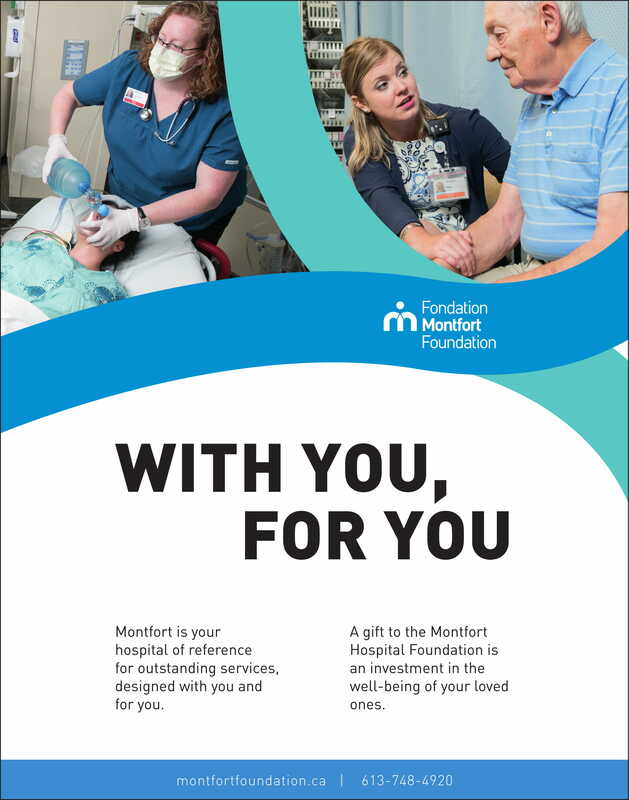 Supporting the Montfort Hospital Foundation is investing in the well-being of our loved ones before they need help. At Montfort, more than 250 volunteers work closely with staff, day in and day out, to greatly enhance the quality of patient services and significantly improve daily life in our institution. If you or anyone in your family has received care from Montfort within the past two years, you can become a patient partner. You will represent the voice of our patients by sharing your impressions of your experiences to improve the quality of care and services offered at Montfort. Since its inception in 1994, the event raised more than $2 million in support of Montfort. Mark your calendar. Next year’s charity golf tournament will be held on Friday, June 7, 2019 at the GreyHawk Golf Club. The construction of the new Orléans Health Hub will be the focus of the Foundation’s next $12 - million major fundraising campaign. This project involves the construction of a unique and innovative health centre at the intersection of Mer Bleue Road and Brian Coburn Boulevard in Orléans. This prototype project is the first of its kind in Ontario and is part of the government's commitment to support community hubs and help Ontarians in their daily lives by facilitating access to multiple services offered under the same roof. The Hub will provide services to patients, from newborns to the seniors, with complex or multiple interrelated conditions by bringing together a number of health care and community service partners to address the needs of clients through a comprehensive service delivery model.